TAMPA, Fla./WACO, Texas (August 3, 2018) – IRONMAN, a Wanda Sports Holdings company, is thrilled to announce Bicycle World Texas, a premier cycling company with six stores across Texas, as the title sponsor for the inaugural IRONMAN® 70.3® Waco triathlon to be held Sunday, October 28, 2018 in Waco, Texas. Bicycle World Texas has been serving triathlete needs since 2004 while supporting half a dozen triathlons every year. The Bicycle World Texas IRONMAN 70.3 Waco triathlon will begin with a 1.2-mile swim in Brazos River, starting almost directly below the Waco Suspension Bridge, the oldest suspension bridge in the Southwest. Athletes will then embark on a 56-mile single-loop bike course along rural country roads of McLennan County and through the Waco wetlands. The day concludes with a two-loop, 13.1-mile run capturing the natural beauty of Cameron Park. Triathletes will finish as they cross over the suspension bridge. The event has already attracted over 3,000 registered triathletes from 48 states and 19 different countries. “We’re excited to team up with the IRONMAN brand and welcome them to Waco,” said Bicycle World CEO and President, Todd Behringer. “The Bicycle World Texas IRONMAN 70.3 Waco triathlon represents exactly who we are and what we do. We are Waco. We are triathletes. Our staff is dedicated to this sport as competitors, volunteers and spectators. We’re looking forward to sharing our expertise with the community, creating an unrivaled race experience for everyone.” Behringer is an avid triathlete having competed in 17 IRONMAN® triathlons, including the 2016 IRONMAN World Championship triathlon, in Kailua-Kona, Hawai`i. 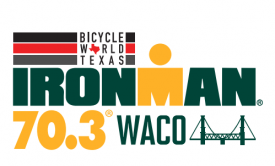 Waco Running Company, the sister company of Bicycle World Texas, will provide additional triathlete support and products inside of the IRONMAN Village expo. Bicycle World Texas and Waco Running Company are managed by The Behringer Group, LLC, a Waco based business development firm owned by Todd Behringer. For more information on the IRONMAN brand and global event series, visit www.ironman.com. For media related inquiries, please contact press@ironman.com. For more information on Bicycle World Texas, go to visitbicycleworld.com.